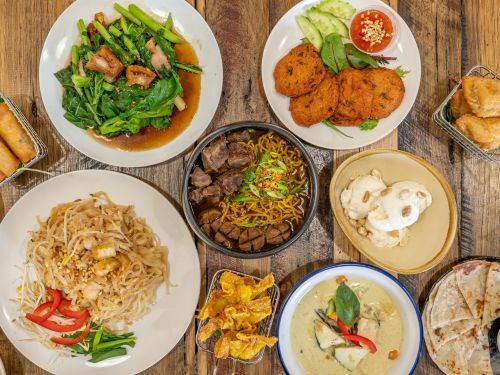 Amon Thai Kitchen uses their own specialised couriers to deliver their food. Vegetarian dumplings filled with chive, golden pan fried served with spicy Thai style soy sauce. Minced beef wrapped in puff pastry. Shrimp, glass noodle, cabbage, black fungus in hand-made pastry. Seasoning potatoes and vegetable wrapped in puff pastry. Tofu and vegetable tempura served with special sweet chilli sauce and crushed peanut. Hand-rolled Thai spring roll served. Marinated chicken, chargrilled served with Thai peanut sauce. Whole prawn marinated, mung bean noodles. Crispy fried boiled eggs, topped with tamarind sauce, fried shallots and coriander. Green chilli cooked with coconut milk, sweet basil, bamboo and eggplant. Red chilli cooked with coconut milk, sweet basil, bamboo, eggplant and pumpkin. In-house grilled chicken with cumin, turmeric, cinnamon in creamy coconut milk with potato. Topped with fried shallot. Thai style beef stir fried with Asian greens and crispy garlic. Peanut sauce with chicken and Asian greens. Ginger, onion, mushroom and homemade sauce. Stir fry chili jam with Asian green and crispy garlic. Thai Street Food Style: spicy sauce stir fried with crispy chicken and Thai Basil. Thai style garlic sauce and topped with coriander. Stir fried home made Peanut sauce with Chicken and Asian Greens . Fried TOFU and home made sauce Stir fried with Cashew nuts , onion, crisp chili. Stir fried mixed green vegetables and Thai style sauce. Prime beef pieces, slow cooked in a sublime curry with cinnamon, potatoes and roasted peanuts. Cashew nuts, onion, fried chicken and home made sauce. Chinese broccoli, chilli, oyster sauce and crispy garlic. Special crispy pork stir fried with Asian greens and topped with crispy garlic. Deep fried fish fillets topped with sweet and sour. Roasted duck, sliced and prepared in a rich red coconut curry with pineapple and tomato. Garnished with Thai basil. Lamb diced slow cooked in panang curry paste with green peas and eggplants on top with kaffir lime leaves. Green curry made from fresh green chili cooked with coconut milk, sweet basil, bamboo, eggplant and Thai basil. Thai style marinated pork neck served with Thai tamarind sauce. Grilled Australian beef served with Thai tamarind sauce. Thai style marinated chicken served with sweet chilli sauce. Stir fried rice noodle with tamarind sauce, egg, garlic, chives, beanshoot and peanut. Flat rice noodle stir fried in our special dark sauce. Fried rice with turmeric, pineapple, curry powder, egg and cashew nut. Stir fried Goreng noodle with Asian vegetables and home made sauce. Hokkien noodle stir fired with special sauce and Asian greens. Flat noodle stir fried with chilli and garlic sauce and vegetables. Fried rice with egg, tomato, onion and greens. Marinated grilled pork neck with homemade Thai dressing and lime juice, chilli, coriander, roasted rice powder and Spanish onion. Chicken mince blended with lime juice, chilli, roasted rice powder, coriander and Spanish onion. Tender portions of pan-seared premium rump beef, finely sliced and tossed in a zesty marinade with traditional Thai herbs. Home made grilled chicken with lime juice, chilli, roasted rice powder, coriander and Spanish onion. Thai style pork minced salad with lime juice, chilli, roasted rice powder, coriander and Spanish onion. Seafood mix with special salad dressing and coriander and Spanish onion. Thailand’s famous spicy soup with special Tom Yum paste, galangal, coriander, tomato, lemongrass and kaffir lime leaves. Creamy coconut milk, Thai chilli and the tang of lemon juice, infused with fresh galangal, lemon grass, straw mushrooms and kaffir lime leaves. Banana in sticky rice with black bean serve with coconut ice cream.